All transactions are safe and secure with a reliable history in online purchasing behind each of our associates. 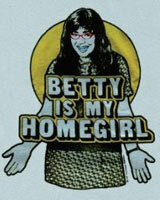 Buy the Betty is My Homegirl t-shirt to own Ugly Betty clothing and merchandise. These Ugly Betty t-shirts let everyone know that you're down with the New York fashion industry's best kept secret, Betty! The front of this tee displays the phrase, "Betty is my homegirl" across the chest in 3D font. Ugly Betty herself is displayed behind the phrase. Be brighter and bolder in your own life with this 100% cotton tee. Wear it with a pair of red Ugly Betty sunglasses. Browse the gallery to see other officially licensed Ugly Betty merchandise items. In addition to the Betty is My Homegirl tee above, browse the Ugly Betty Clothing Gallery for more apparel like men's and women's clothes, kids shirts or hoodies.